A listing of all known facts about the Icewind Dale expansion released in February 2001. A guide written from a more subjective viewpoint, like the ones the author has written for BG2 and IWD2. It explains in considerable detail the kind of analysis, preparation and decision making that can produce a successful campaign. The walkthrough is supported with embedded, annotated YouTube videos and spans the entire length of the game and both expansions. A complete guide dealing with the creation of a balanced party, gameplay-specific questions and many others. It also contains a detailed walkthrough for Icewind Dale, Heart of Winter expansion and the free dungeon Trials of the Luremaster. An excellent walkthrough with detailed info on all the quests in the expansion and expansion's expansion, descriptions of encounters and treasure they yield, character creation, game strategy and tactics. A good game guide with some basics explained in detail. You'll find a detailed description of character creation and full walkthrough here. Another good guide with some basics explained in detail as well. You'll find a detailed description of character creation and full walkthrough here, plus a list of all characters and what (if anything) can be stolen from them. An online guide containing character creation advice, some tips, a list of spells and items, a walkthrough and a few other things. 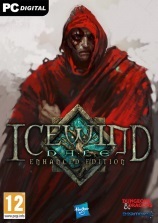 An exhaustive guide to Icewind Dale covering such topics as character creation, general tips & strategies, weapons, spells, enemies etc. It also includes a walkthrough. A downloadable version is available as well. A short low-level party strategy guide describing the four basic types of characters (fighters, clerics, wizards and thieves) and how they should be used in the game, plus some typical strategy tips. A short guide describing the three basic spellcasting classes (mages, clerics and druids) and how they should be used in the game. It is an analysis of "the" spells to memorize at different level ranges (currently from level 1-3).